BRAND NEW JUMPJET. FAN DEFECTIVE, NEEDS TO BE REPLACED. GREAT VALUE! Brand new Jumpjet, Never used or flown! Wing Tips had a hairline crack and repaired. GREAT VALUE! 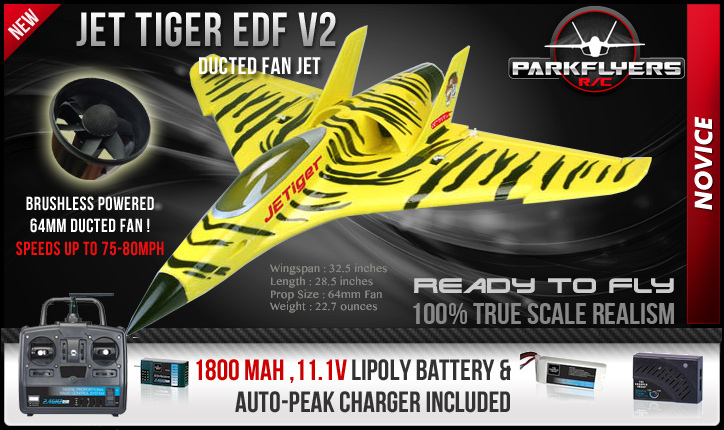 The Jet Tiger Ready To Fly electric ducted fan jet will out fly almost any R/C electric powered plane in its class. Able to each speeds in excess of 80 mph out of the box with no modifications. Powered by a 3600kv brushless motor and a super high rpm ducted fan system running on 11.1 volts of pure power. Uses built in elevon control to steer, roll, elevate and fly inverted. Features a state of the art DSM 2.4 GHZ radio system for trouble free and long range reception. DSM radio systems are virtually bullet proof when it comes to radio interference and reception. Included is a Li-poly automatic variable rate balancing peak charger with A/C adapter with built in failsafe charging technology for added safety. Included is an 1800 mah 11.1 volt Li-Poly battery with e-flite compatible balancing plug. The Jet Tiger was designed with state of the art Cad Cam computer software for the most aerodynamically efficient rc jet design possible. Modular interlocking design allows easy access to all electronics and ducted fan unit for easy repairs and maintenance. The main fuselage canopy features a ONE twist release canopy bolt. A special EPP type foam construction allows for more durability than regular Styrofoam. Wing span: 32.5 inches, Length: 28.5 inches, Weight: 22.7 ounces, 64mm Fan Unit, Motor: 3600 kv brushless, Radio: 4 channel 2.4 GHZ, Servos (2) 9 gram micro, Charger: Peak/ Balanced, Battery:1800 mah 11.1v, Range: 4000 feet. The 15-page manual covers everything from safety, assembly, charging, to plane and radio setup and troubleshooting. Additional manuals are included for more details on the 4-channel 2.4GHz radio system, the LiPo balancing charger, and USB cable instructions. The assembly is very quick. Simply screw in the fins with the supplied screws and screwdriver, glue the nose piece with the supplied epoxy, and press the tail cone in place after removing the backing from the pre-applied double-sided tape. The servos, control rods, and linkages are all pre-installed. The Jet Tiger V2 comes with two bottom lexan skids to help protect it on landings. Has two finger holes on the bottom of the fuselage for easy hand-launching. Wing span: 32.5 inches, Length: 28.5 inches, Weight: 22.7 ounces, Motor: 3600 kv brushless, Radio: 4 channel 2.4 GHZ, Servos (2) 9 gram micro, Charger: Peak/ Balanced, Battery:1800 mah 11.1v, Range: 4000 feet.